The idea of a clip-on bow tie is enough to give any red-blooded fashionista an outbreak of hives, but if you could make stylish clip-ons with all the attention to detail and panache of a traditional bow tie? Why not, right? Sometimes you’re in a rush, and a clip-on tie would make a convenient and terrific last minute amendment to your outfit. 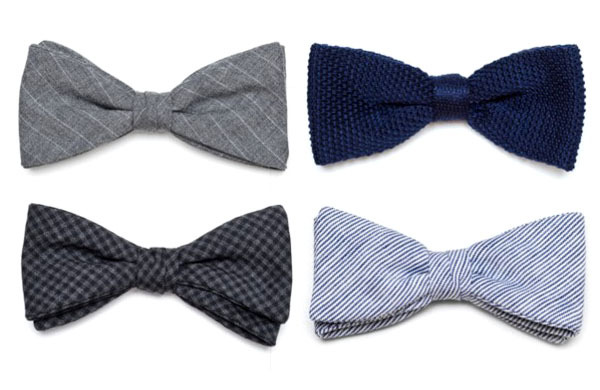 Such is the thinking of Los Angeles fashion stars Band of Outsiders, who have crafted 6 different designs of clip-on bowties to choose from — from seersucker to pin stripe to natural cotton canvas to navy tricot — ranging in price from $73.50 to $105. Nice.